Urban Horse Promotes a Trouble Free Trailer Loading Parelli Natural Horsemanship DVD by Pat Parelli. Trouble Free Trailer Loading DVD - All Horse Lovers Must View This DVD! 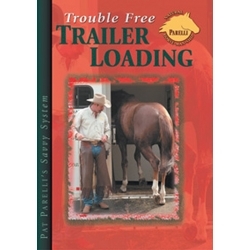 "Trouble Free Trailer Loading" this isn't just about teaching horses to load themselves into trailers. It's about horse behavior at its most profound level. If you can convince a horse to feel safe, comfortable and enthusiastic about getting into a trailer, you'll learn more about getting into the horse's mind than most people think possible. First Session (90min.) Pat convinces Allure, a four-year-old Warmblood, that the trailer is a good thing! Second Session (26min.) It's one thing to convince Allure to load once, but will he do it again and again... willingly? Student Horses (42min.) Pat teaches two students of Parelli Natural Horsemanship to successfully load their horses. Q&A (23min.) Pat answers many common questions about trailer loading and traveling plus offers solutions for the inherent frustrations and problems commonly experienced by horse lovers.